We apologize, but we are having trouble with the course key you are trying to redeem. You may have previously redeemed this key, in that case you want to go to your My Courses page and launch the course from there. If you continue to experience difficulty and would like to speak to a Customer Service Representative, please call (800)854-1001. The course key you are trying to redeem is ''. We apologize, but we could not redeem your Rockwell Collins course key. Please call a Customer Service Representative at (800) 854-1001. Once your Course Key has been entered, click Login to Your iLearn Account or Create a new iLearn Account. Note, your iLearn Account is separate from your KingSchools.com shopping account. TERMINATION OF LICENSE: This license is effective for the period beginning with course(s) enrollment and continuing through 90 days after course(s) completion, or until otherwise terminated. KSI may terminate this license at any time if you fail to comply with any conditions of this license. In the event of termination, you will discontinue use of the instructional materials provided and no refund shall be made. This is how your name will be shown while taking the course and on any printed documents. You will not be able to change your name once the enrollment is completed. Please answer 3 different personal information questions. This is so that we can positively identify you when you forget your password or we suspect that someone else is trying to access your account. Please confirm your entries, as you will not be able change your answers once they are submitted. If these answers are correct, click the Next button. If you need to make some corrections, click the Cancel button. We require that you provide us with your CFI Certificate expiration date. You can find this on the back of your CFI Certificate. 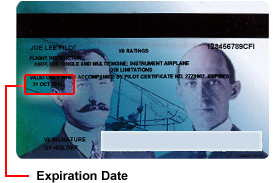 Since you chose to allow King Schools to process your flight instructor renewal we require the following ID information and a mobile phone number. Please review and confirm the following information. If this information is correct, click on the OK button. If you need to make any corrections, click the Cancel button. Middle name is a required field to enroll in a FIRC. Middle name is a required field to enroll in a FIRC. If you do not have a middle name please check the box "No Middle Name". We are sorry but you cannot enroll in your FIRC course since your CFI expires within 48 hours. There is not enough time for you to complete the course and for us to process your renewal. Please contact customer support with any questions at 1-800-854-1001 (+1-858-541-2200 worldwide).